A series of 12 unusual earthquakes in northern Ohio reached a 4.0 magnitude on New Year’s Eve, shaking homes in Youngstown and intensifying nationwide opposition to fracking, a controversial natural gas extraction process. John Armbruster, a Columbia University seismologist hired by the Ohio Department of Natural Resources (ODNR), located the quakes’ epicenters near the base of a wastewater injection well operated by D&L Energy. One of 177 injection wells in Ohio, this one was greasing the palms of a previously unknown fault line, by pumping gas industry wastewater right into it. In response to the finding, Gov. John Kasich suspended injections at that well and at four inactive sites in the same area. 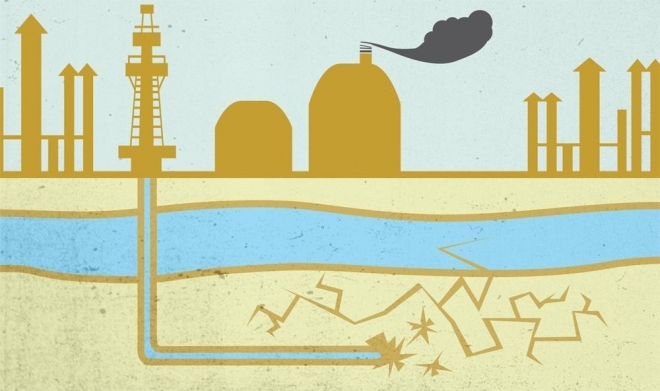 Those injection wells dispose of wastewater generated by fracking wells, whose job it is to extract natural gas by blasting pressurized slurries of water, chemicals and sand into ancient shale formations, thousands of feet below ground. Although it hasn’t been known to cause earthquakes, fracking — or horizontal hydraulic fracturing — creates its own problems. Ask Thelma Payne. Ms. Payne, now 88, and her husband Richard Payne, 91, were asleep in their bed one night in December 2007, when an explosion in their basement blew their Geauga County home straight off its foundations. The couple bounced up and landed safely back on their mattress; the house landed back on its foundation, but was damaged beyond repair. This entry was posted in Uncategorized and tagged john armbruster, John Kasich, natural gas extraction, ohio department of natural resources. Bookmark the permalink.